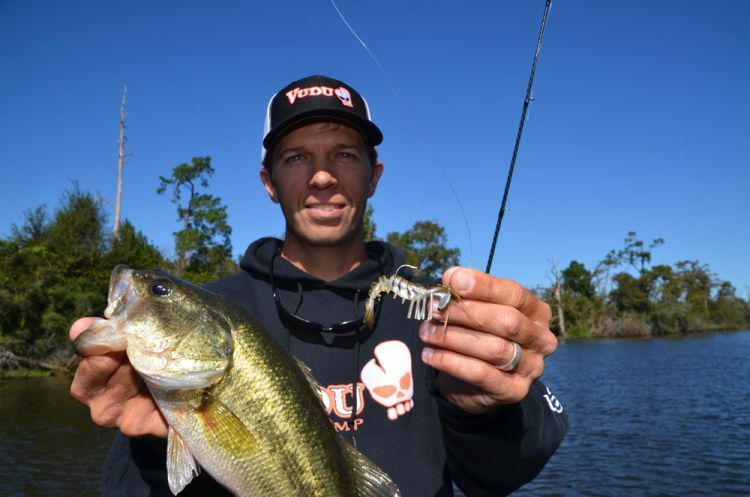 Vudu Shrimp, a lure originally designed for saltwater species, is very effective for marsh bass. 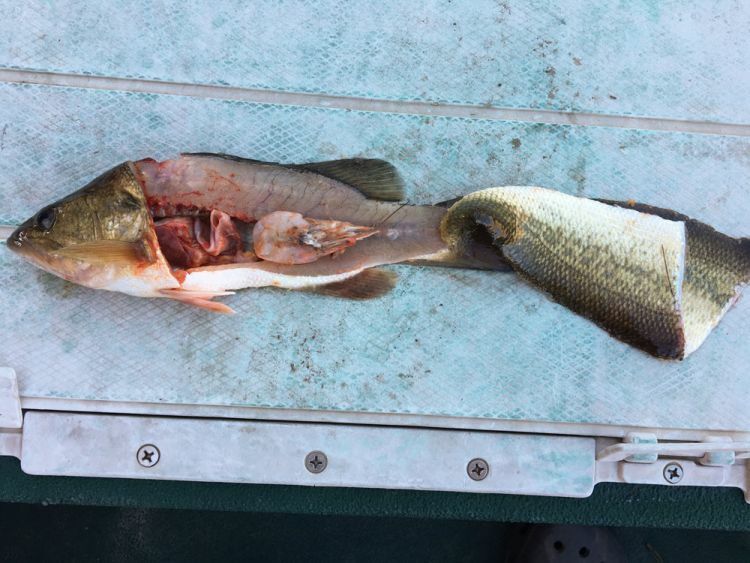 The stomach contents of this Sabine River largemouth bass shows what the river’s fish feed on. Chaumont recommends the best colors for marsh bass fishing to be, from top to bottom, brown, golden and natural. Watkins emphasized that industrial structure set in the channel of the river itself can be very productive. Ken Chaumont has decades of experience in the freshwater and saltwater lure business. 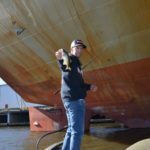 Setting the hook on a bass under the looming sides of an ocean-going cargo ship was an unusual experience. Watkins shows off one of 11 bass taken from the mouth of the cut behind and to the right of him. 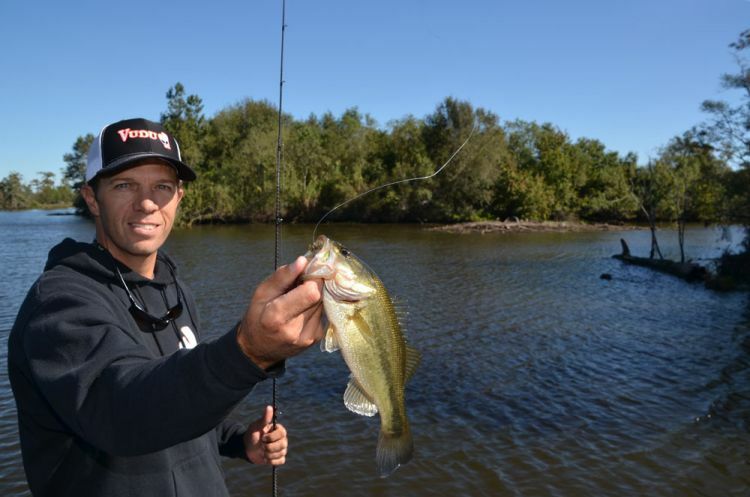 Largemouth bass in the Sabine River follow the bait — and that means successful anglers can fish a shrimp pattern in the fall to fill their box. “We are very blessed,” Johnny Watkins said. 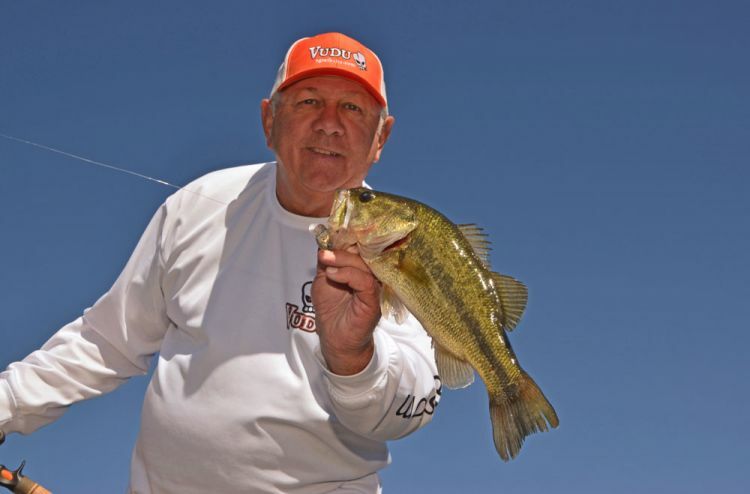 “There are very few places where you fish bass on a shrimp pattern. 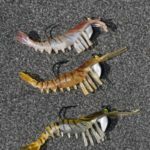 “Shrimp will occur in the summer, but we really start seeing them in the fall — September through December. Any kind of north wind 5 to 7 miles per hour will flush them out of the marsh. “These Sabine River bass know it when it happens. Those fish know it,” he reiterated emphatically. “They prefer shrimp over anything else. Watkins launched his boat in Orange, Texas because it is a good, wide, multilane public facility maintained by the City of Orange. He eschewed using the Burned Out Bridge Launch on old Highway 90 southwest of Vinton. “It has limited parking, especially on weekends, and also a history of occasional vandalism,” he explained. At the launch, we were 5 miles upriver from Sabine Lake and about 60 miles south of Toledo Bend Reservoir. The area not industrialized was beautiful, freshwater marsh broken by individual and clumped cypress trees. The closer we came to Sabine Lake, the fewer the trees became — and the more the landscape was dominated by stands of 6-foot tall roseau canes. After the tide began falling well, they would shift to fishing drains, sloughs and cuts coming out of the marsh — that hopefully would be carrying shrimp in their flow. 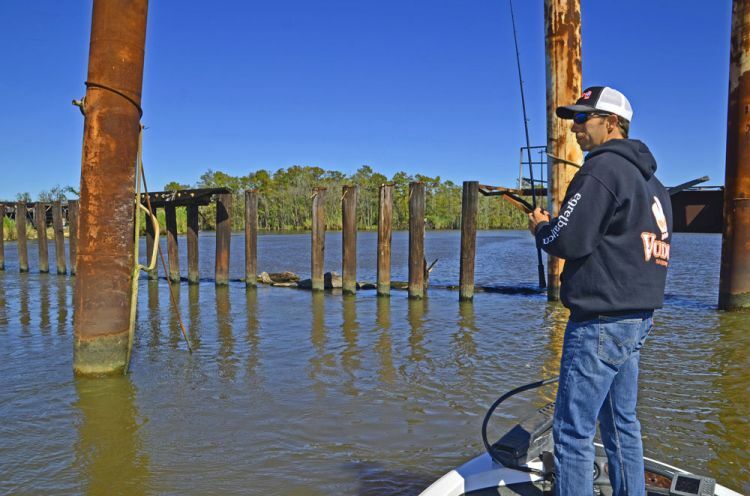 “The good thing about all this industrial structure,” said Watkins, “is that on this river, unlike Calcasieu River, you can catch fish on a rising tide. When the current swirls around any structure, it always creates an eddy that serves as an ambush point for bass. All of the industrial structure in the river is located on the Texas side. The Louisiana side is totally different — wild and natural in appearance. Our first stop was a barge canal just below the boat ramp. A massive number of the big steel hulks were parked in the canal awaiting repair work. A half-mile into the canal, passage was blocked bank to bank by a barge placed crossways to form a vehicular bridge. 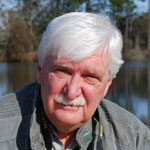 Water exiting the canal was forced under the barge, creating an up-welling effect, ideal for bass ambushes, Watkins said. He began with a 3 ¼-inch Vudu Golden Shrimp, fishing a tight-line. Chaumont tied on a shallow running, suspending Zombie RIP Stik in clown around color, also made by Egret Baits. One lure imitated shrimp, the other pogies. 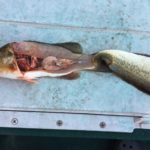 Used to fishing together, when one found a solid pattern of what the fish preferred, both shifted to that lure. The first bass came on board at 9:15 a.m. as half of a double. It was followed by a bull red, then another bass. 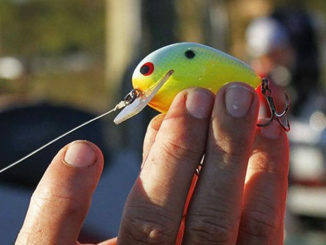 Chaumont replaced his RIP Stik with what was then a prototype of what is now sold as a Vudu Vixon, a paddle tail-style lure. Watkins trolled the boat from the cross-barge to the racked rows of barges, positioning it for them to be able to toss their baits under the barges’ overhanging bows and into the shade. Again they jacked bass after bass out of their lairs. 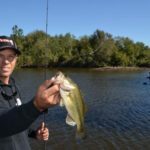 “The bass we are going to catch today,” said Chaumont, “are typical marsh bass, with the exception of those at Lacassine (National Wildlife Refuge). A 1 ½- to 2-pound fish is good; 3 is great and 4 pounds is a trophy. 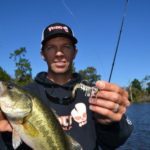 “Use light tackle to feel the bite, and it’s a lot of fun,” added Chaumont. Next they moved to the Port of Orange, essentially a big canal running parallel to the river and holding a massive, ocean-going cargo vessel tied to the dock. Watkins pulled the bow of the boat beneath the looming bulk of the behemoth. 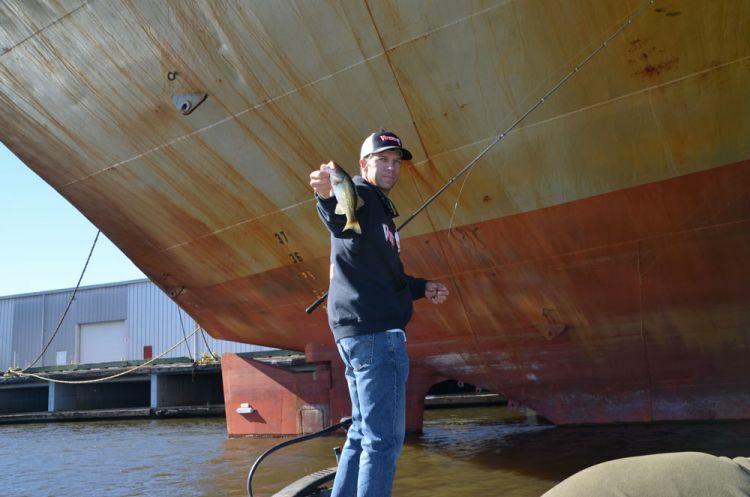 It felt unusual to see largemouth bass come out from under the keel of an ocean-going ship. The bite got faster-paced as they moved to the propeller and rudder of the vessel. One final industrial stop put them at metal and wooden pilings set in the main stem of the river itself. By 11 a.m., Watkins and Chaumont deemed the tide to be falling hard enough to fish what they called “cuts.” These were 30- to 40-yard-wide bayous draining into the river or into Adams Bayou. The Sabine River is intersected by the Intracoastal Waterway from the east, and the two run as one channel to Sabine Lake. Adams Bayou opens into the combined channel from the Texas side. The habitat along Adams Bayou was a little different than near the river itself. It was still flat, but higher in elevation. Pine trees appeared and oaks replaced cypresses. They hit the cuts intersecting Adams Bayou hard, focusing on the downstream points of the intersections. Using variable retrieves, every cut yielded fish, none huge, but all willing and spunky. Leaving Adams Bayou, they moved up the Sabine River above the landing to focus on cuts coming in from both sides of the river. Typically smaller than the cuts in Adams Bayou, 20 to 30 feet in width, they were just as productive as the larger cuts to the south. Here again, the banks were heavily wooded. 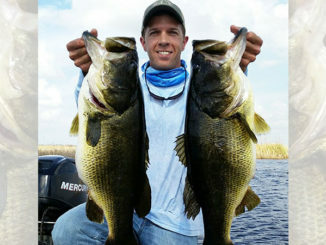 “You can catch 25 bass from a single cut here on a north wind and falling tide,” Watkins said. The best we did was 11 from a single cut. The Sabine River is considered “border water,” but fortunately Louisiana and Texas have a reciprocal licensing agreement for the lower river and Sabine Lake, like that on Toledo Bend Reservoir. Wildlife agents from each state recognize the licenses of anglers from either state as being valid on the river and its small tributaries. 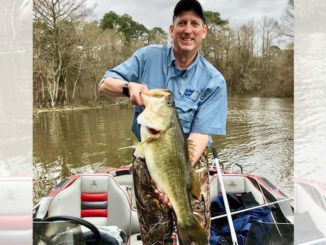 Editor’s Note: According to the Texas Parks and Wildlife Department, no matter where you launch your boat, if you are actively fishing west of the imaginary boundary line bisecting the Sabine River, you must be in compliance with Texas rules, which are a five-fish daily creel limit and a 14-inch minimum for bass. 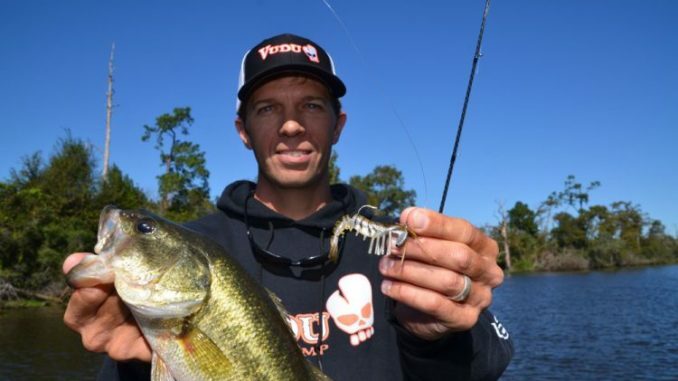 In Louisiana waters on the Sabine, there is no minimum size requirement and a 10-fish daily creel limit. Except for the massive Toledo Bend Reservoir formed from its waters, few Louisianans know much about the Sabine River other than that it forms the state’s border with neighboring Texas. Better known is the Calcasieu River, the drowned mouth of which is Calcasieu Lake, commonly called “Big Lake” by dedicated speckled trout anglers. Although only 20 miles apart, they are totally different rivers, as noted by Johnny Watkins. 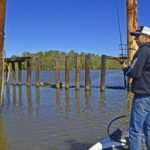 “The Calcasieu has a saltwater barrier on it — a water control structure with a lock located north of Interstate Highway 10. The Sabine is more natural. When winter rains slack off, typically late April or early May, saltwater begins to intrude up the river. Pogies are heavily used by largemouth bass as food, and are found in the river from May until it gets “really cold” in December, explained Watkins. Shrimp are prevalent mainly in the fall months. Because shrimp tend to penetrate deeply into the marsh, experienced bass anglers take advantage of tidal cycles for fishing. “Sometimes we won’t leave the house until 11 a.m. because we want to fish on falling tides,” Watkins said. Not much further upriver from the tidally-influenced lower river, it changes character rapidly. Ken Chaumont, 63, remembers his early experiences on that section of the river. “I started to fish it right out of high school. We would launch at Niblett’s Bluff on Highway 12 to fish it. It is a narrow, winding river with lots of sandbars. Most of the bass we caught were spotted bass, although some of my biggest largemouths came from the upper river. “It’s a gorgeous river, but you need an aluminum flatboat to fish it, not a bass boat. The upper river is also dramatically affected by power generation water releases from Toledo Bend. 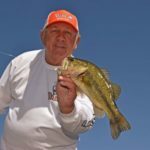 With 34 years in the fishing lure business, Ken Chaumont is often recognized for the longtime role he played with Bill Lewis Lures and Stanley jigs. Then in 2013, with the introduction of the Vudu Shrimp, the Iowa, Louisiana resident founded Egret Baits. Naturally, he loved to talk about his lures. 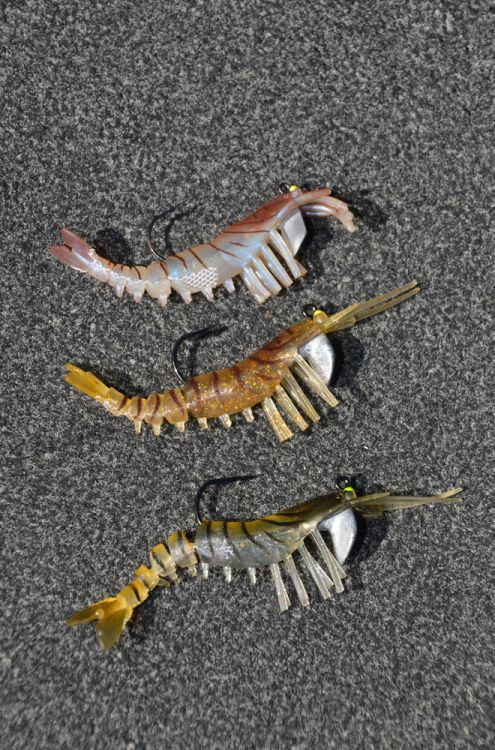 “What Johnny is throwing (a 3 ¼-inch Vudu Shrimp) is the original lure made by Egret Baits. We designed it as a saltwater lure. But when we used it along weed lines in sweetwater marshes for redfish, we did really well with bass. “Anywhere you have brackish water, where saltwater and freshwater mix, it is a big lure. The 3 ¼-inch size has tremendous importance, because it imitates a 31-35 count shrimp, the predominant size shrimp coming out of the marsh. Vudu shrimp made their reputation by being fished beneath a popping cork, but for bass fishing, presentations without a cork are best. On the first cast into a spot, Chaumont and Johnny Watkins often use a fast retrieve, almost popping the lure to the water’s surface. Then they slowed down and made a mid-water retrieve, followed finally by bouncing it off the bottom as they reeled it in.